Be the first to share your favorite memory, photo or story of Arlysse. This memorial page is dedicated for family, friends and future generations to celebrate the life of their loved one. 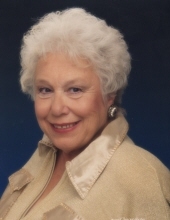 Arlysse Jean “Jean” Michaelis passed away, at the age of 88, on February 2, 2019, in Bozeman, MT. She died after a lengthy battle with Alzheimer’s Disease. Jean will be remembered for her infectious laugh, generous and positive spirit, and her fierce love for her family and close friends. Jean was born to Archibald and Luella Gilbertson on January 5, 1931 in La Crosse, WI. Her childhood years were spent in MN, ND, WY and CA. She graduated from high school in Peterson, MN. While attending the University of Wyoming, she met James “Jim” D. Michaelis. They were married in Billings, MT, in 1951. Jim and Jean raised five children in Basin, Greybull, Lovell, Casper and Newcastle, WY. They then moved to Cheyenne, WY, where Jean was employed, as an Accounts Agent, at the WY State Liquor Commission. After retirement, Jim and Jean enjoyed being RV snowbirds for several years, eventually moving to a house in Green Valley, AZ. They spent summer months in Basin, WY, until Jim’s death in 1999. Jean relocated to Basin, until she required living assistance and moved to Bozeman, MT. Jean enjoyed traveling, golfing and sewing gifts for her grandchildren. She was Jim’s construction assistant on many DIY projects. Whether playing cards, trout fishing or visiting with family or friends, Jean was the life of the party. She leaves five children: Nancy (John) Kerhlikar of Shingle Springs, CA; Jim Michaelis of Newcastle, WY; Tim (Vi) Michaelis of Johnstown, CO; Janie (Scott) Sukut of Bozeman, MT; and Kim (Chris) Michaelis of San Diego, CA; 13 grandchildren; 4 great-grandsons; brother, Christopher “Kip” (Joanne) Gilbertson of Dodge City, WI; sister, Naomi (Jim) Anderson of Westfield, IN; sister-in-law, Sheryl Michaelis of Buffalo, WY; sister-in-law, Sandy Michaelis of Graham, WA; numerous nieces & nephews; and long-term partner, Felix Saldana, of Bozeman, MT. Jean was preceded in death by husband, Jim; parents, Archibald and Luella Gilbertson; stepmother, Barbara Gilbertson; and brother, Charles Gilbertson. A Mass of Christian Burial will be held at Sacred Heart Catholic Church in Greybull, WY, on May 11, 2019, at 11:00 a.m., followed by internment at Mt. View Cemetery, Basin, WY. In lieu of flowers, monetary gifts may be made, in Jean’s name, to St. Joseph’s Children’s Home, P.O. Box 1117, Torrington, WY, 82240. To send flowers or a remembrance gift to the family of Arlysse Jean Michaelis, please visit our Tribute Store. "Email Address" would like to share the life celebration of Arlysse Jean Michaelis. Click on the "link" to go to share a favorite memory or leave a condolence message for the family.